It's not news that we can 3D print bones or even successfully implant 3D-printed skull fragments. 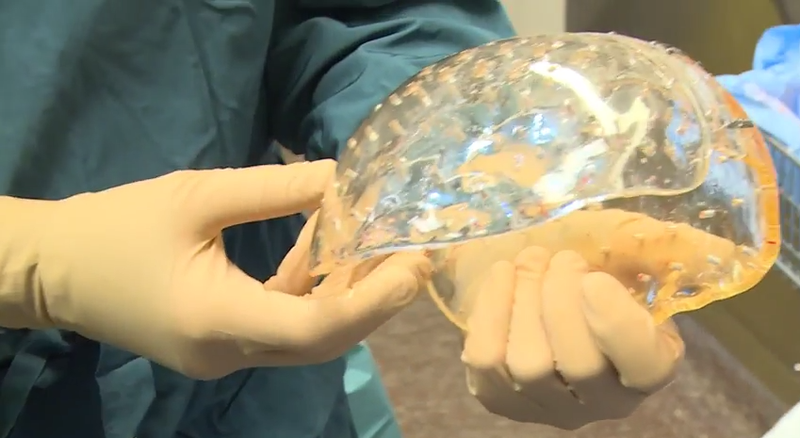 But a team of Dutch brain surgeons has taken things to the next level by replacing the bulk of a woman's skull with a 3D-printed dome. It's a little bit gnarly to watch. Nevertheless, it was a life-saving operation. The 22-year-old patient suffered from a rare condition that caused her skull to thicken, increasing the pressure on her brain. At the time of the surgery, the bone was 5 centimeters thick—over three times the normal thickness. The team of doctors at Utrecht University's UMC made a perfect copy of her skull using a 3D printer and fitted it to her head in a 23-hour-long surgery. The entire procedure took three months and is the first of its kind, according to the hospital. "Implants used to be made by hand in the operating theatre using a sort of cement which was far from ideal," explained Ben Verweij, who led the operation. "Using 3D printing we can make one to the exact size. This not only has great cosmetic advantages, but patients' brain function often recovers better than using the old method." Warning: If you watch this video, you will see human brains. It's graphic.